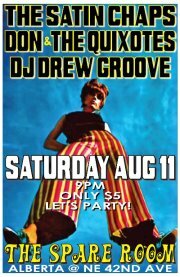 Quixotes at The Spare Room with the mighty Satin Chaps & DJ Drew Groove! This Saturday! That’s Right. This is a rave up. This is a throw down. 60’s surf sleaze meets 60’s organ party. DJ Drew Groove is ringleader! This is a dress up thang! At The Spare Room, Portland’s Finest Functional-Lounge-Attached-To-Dead-Bowling-Alley, Saturday August 11, 9PM!